According the ABI’s Home Insurance Premium Tracker the cost of home contents insurance now stands at a record annual low of £127 a year - or £2.40 a week. The figure stands at its lowest since the ABI started collecting the data back in 2012 and compares to the £4.40 that the average household spends on takeaway meals a week. Yet despite this, one in four UK households – some 6 million – have no insurance to cover their possessions. The ABI’s Home Insurance Premium Tracker measures what consumers pay for their home insurance, rather than prices they are quoted. 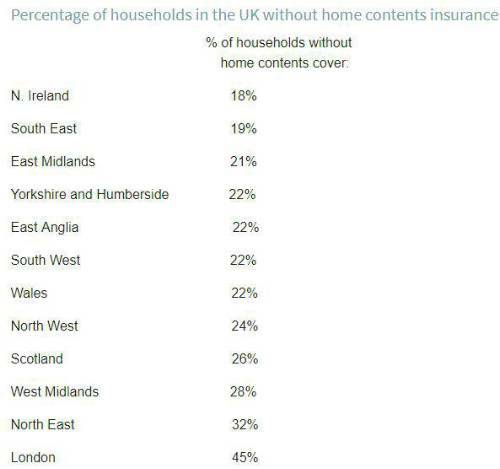 Northern Ireland households are the best protected, with 82% insured, while Londoners the least protected with only 55% having contents cover (figures based on ABI analysis of Office for National Statistics data). The average price paid for buildings insurance, at £258, fell by 8% on 2017 to its lowest level since 2015. While the average price paid for combined buildings and contents insurance, at £307, rose slightly by just over 1% on the previous year, it was still the second lowest figure since ABI started collecting the data in 2012. Laura Hughes, ABI’s Senior Policy Adviser, General Insurance, said: “While the average cost of home contents insurance is at an all-time low, too many households are still playing Russian roulette with their possessions. The Financial Conduct Authority (FCA) has today published its Business Plan for 2019/20, which outlines the key priorities for the coming year.